I got this recipe over the counter today as Mike Shepard and his wife came in to pick up their order. We'd love to hear your recipes! Send them to me at claudia@cordrays.com. Puncture venison loin roast with a knife point. Stuff slices of fresh garlic into the holes. Rub the loins with olive oil to cover. Place the loins in a baking bag and add a can of cream of mushroom soup. Bake for 1 hour and 15 minutes at 350 degrees. The next day, use your leftovers for Beef Stroganoff. Add some sour cream and mix with egg noodles! Fresh Cordray Farms Beef Cuts in the Meat Case! We're adding fresh beef cuts to the case today. We have chuckeye steaks, mock tender steaks, flat iron steaks, beef ribs for BBQ, rib stew, pinwheel steaks and skirt steak. All of it's born and raised on our farm. The meat is dry aged and vacuum packaged right here. We also have some beef shares available. It's our definition of local. If you can see the cows grazing out the window, it's local! Ask anyone, and they'll tell you I'm not a cook. I make a mean webpage, but often find my cooking interrupted by my LIFE! So I'll share my recipe for an old family favorite. Originally, my mom made this in a cast iron frying pan over the campstove when we went camping - 4 kids in a tent - in the mountains. It's really never tasted that good again. 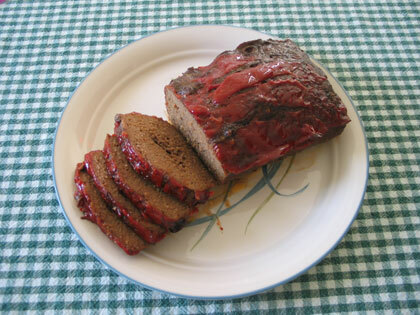 For this recipe you'll need 1 1/2 to 2 lbs of ground beef or venison. If it's fall, that may mean going in the huge outdoor freezer to lug 50 lb boxes out of your way to find the one labeled for family use. If it's winter, that may mean moving dead ducks, alligator heads, wild geese and the occasional chucker in the backporch freezer to find frozen hamburger. If it's summer, that probably means we sold all the beef, so get ready to go to Waffle House. Anyhow, however you get it, you need a couple of lbs of ground meat. Brown it. If you're using venison, you may have to add a little olive oil to keep it from balling up in those annoying lumps. If someone brings a very large alligator into your backyard and wants their picture taken with it, reduce the heat to a low simmer and add a cup of water so you won't burn down the house before you get back. Add 2 cans of Campbell's Vegetarian soup. If you don't have that, pick any vegetable looking soup. Chicken and Noodles does not do well. Now if the computer burps outside and someone, who will remain nameless, clicks 42 times to print a document, you'll need to go outside and reboot everything. Add another cup of water, reduce the heat, and try to remember it's on the stove. When you get back, add some ketchup and mustard. It's where I rinse out the bottles and use that last smidgeon that's been hanging out eluding your grasp. Let it cook for as long as you can, unless a cow is having a calf and you have to go hold the flashlight. In that case, turn it off and cover it. That way it will cool enough for you to put it in the fridge for tomorrow's supper. Once it's the consistency of thick chili, you're ready to eat. Serve it in a bowl or over brown rice. Add a salad and brown bread and you've got a pretty hearty meal. Unless the phone rings and someone's just got to have you outside taking pictures of the deer that has both male and female plumbing. Somebody's gotta do it! 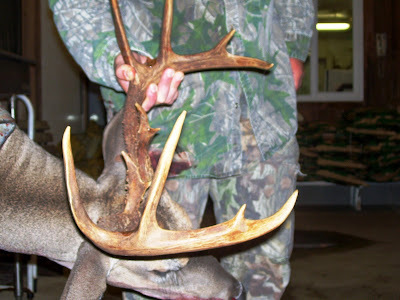 This big 9 point has a split G2. Or at least that's what Kenneth told me! 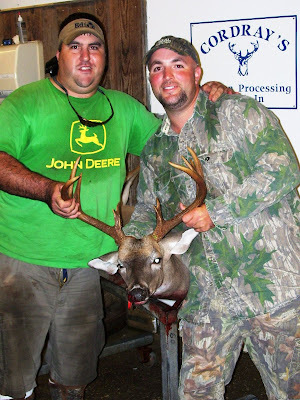 Here's Josh with his trophy and his buddy! Josh Joyner got this 13 point! And pack these in tomorrow's lunch! Try out our new snack! What is an approximate cost for processing? The cost of processing a deer is based on the weight of the deer and on the complexity of the order. 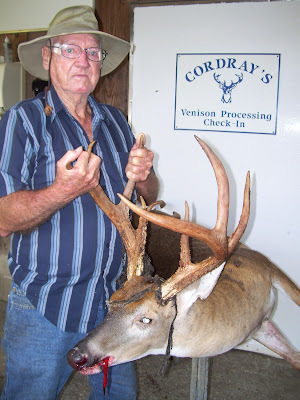 An average sized deer of 100 pounds (carcass wt. 60-65 lbs,) already skinned with just the basics (steaks, roasts, and burger) will cost about $40 to $45. If you need us to skin it, add $25. Adding cooked items, linked sausage or other "champagne" items will ruin your "beer" budget. Don't be hesitant to ask us to give you an estimate. We understand living on a budget. 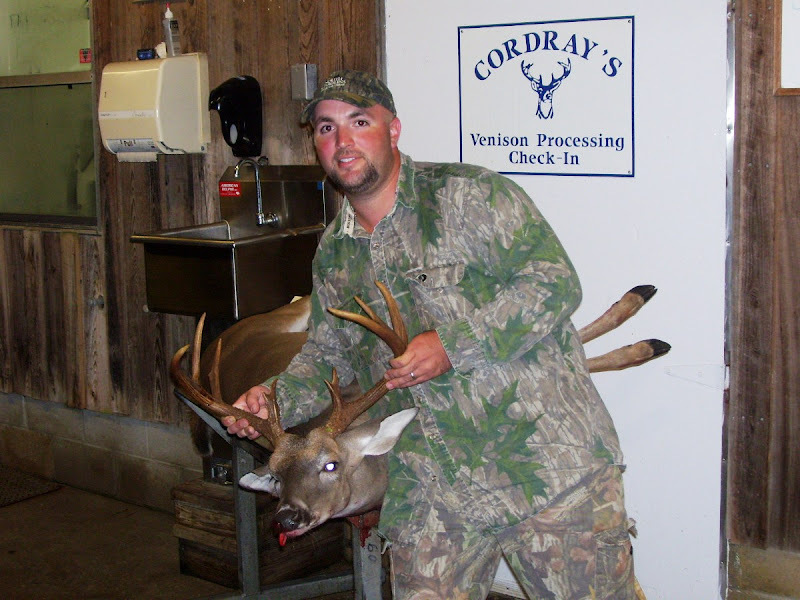 We can give you a fairly accurate idea of the yield and cost of processing your deer. Members of our staff have attended training in safe meat handling and safety through Clemson University and the American Association of Meat Processors. Owners, Michael and Kenneth Cordray, hold BS degrees in Animal Science with emphasis on meat science. Our facility is state inspected by the SC Meat and Poultry Inspection Service and holds an A rating from the SC Department of Health and Environmental Control. All of our smoked products are made from meat cut, seasoned, cooked and packaged on our premises under our careful supervision. We welcome you to come in and look behind the scenes any time. 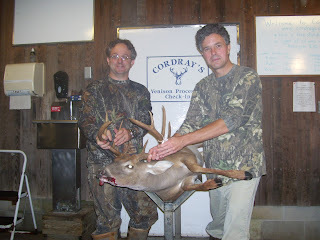 Cordray's Taxidermy site has elk photos posted! 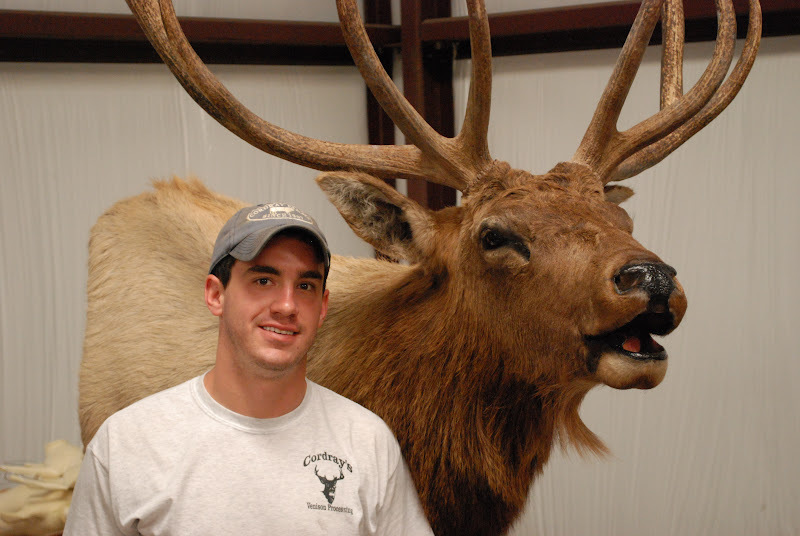 Click on the title above to go to Kenneth's site to see more photos of the elk he just finished mounting. Email him at kenneth@cordrays.com if you have questions or give him a call at 843.509.7720. What can you do to maximize your processing dollar? Deer left overnight in the field are not usable the next morning. The exception is when our overnight temperature is below freezing all night long. There are too many deer out there to risk your family's health by trying to process one that has set out over night. If you field dress your deer, keep the carcass cool. Filling the body cavity with ice chills the meat quickly. A large clean trash can with a tight fitting lid can hold a carcass on ice for several hours and protect it from insects. Dirt, leaves, hair and stomach contents can introduce bacteria to your venison. If you skin and clean your deer, wash the carcass with clean water. We will not allow you to eat contaminated meat. If there is any sign of debris or spoilage, we will agressively trim your meat. You will be wasting your money and your meat. You will only get back edible, clean and safe meat from Cordray's. Think about where you do your cutting if you or your club cuts up the carcass. Prepare the surface by washing or covering with a clean trash bag. Use clean knives and wash them during and after the skinning process and before cutting up pieces. Wash your hands after every step. NEVER transport skinned unwrapped carcasses in an open truck bed. If you wouldn't put your sandwich on it, don't put your deer meat on it! Freezer burn will damage venison. If you freeze the venison before processing, carefully wrap it in air tight wrapping. Many people do an excellent job by wrapping their deer in several layers of plastic grocery bags. If you plan to bring in frozen meat, bring it before Sept. 14th or on the second Saturday in January. Don't be surprised to take some tough, but well meant, tongue lashing if you bring in meat that is dirty. 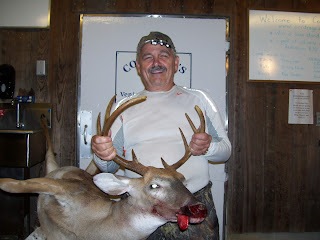 We're trying to help you, so that you'll get the highest and best quality yield from your hunt. We send dozens of people back down the driveway with meat that is too dirty or has been left warm for too long. Don't let this happen to you! It's not that we don't want your business, we do, but we've got to be sure that you get a quality product back!